The official rules (subject to clarification). If you're not signed up, you can not log any benchmarks for the contest. Target - any benchmark you have not found. Others may have found it, just not you. Spell "2oldfarts" using the 1st digit of the designation (they must be listed in the GC.com database) of benchmarks that you find. For this bonus you may use any benchmark in the GC database (including those you have found over a year ago. Log those as a note only, please. ).This is a one time bonus worth 25 points. Scoring = 1 point per verified regular benchmark find plus any special finds that qualifies. Intersection stations (towers, flagpoles, & other tall benchmarks) will need a picture showing the benchmark up close. You must be no farther away than a city block. Pictures of a disk must be readable. If we can't read the disk there is no way we can verify the find. Finding a DNF = 5 points - the last log must be a 'Did Not Find' logged before January 25, 2007. DNF means 'not found' by anyone or any agency. The listing will need to be in the GC.com database, so it can be logged for the contest. If the DNF is only on the latest version of the datasheet, then you will need to post a link to that datasheet in your contest log entry. Finding a Destroyed = 10 points - for this class it will need to be a 'Destroyed' on GC.com, or "Presumed Destroyed" on the NGS datasheet (& be in the GC database) logged before January 25, 2007. If the Destroyed is only on the latest version of the datasheet, then you will need to post a link to that datasheet in your contest log entry. Finding a wrongly logged benchmark = 15 points - any benchmark where the 'last' log is wrong (must be listed on GC.com). GP0124) is still available for the contest. We will have a special thread for logging your recoveries. 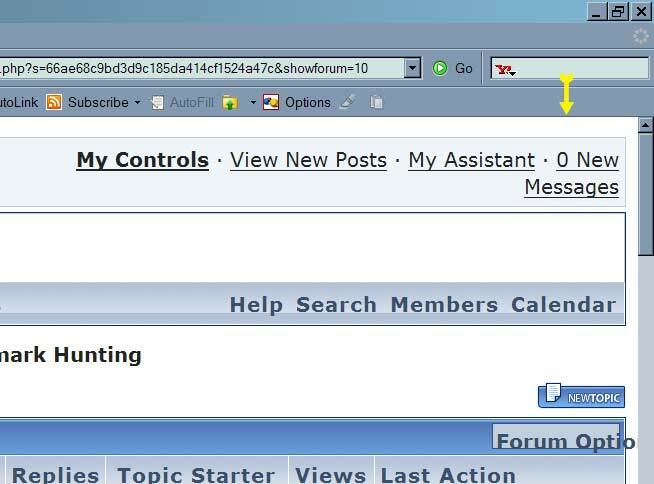 Post a hot link (using the designated format - listed at the time the thread is started) to your GC.com log in the proper thread here in the forums. If you need help, just ask. Remember, you must be signed up before you can log any benchmarks for this contest. The 2oldfarts will be the final judge on all logs, so beware the dreaded " PM from John". For those that do not know about PMs, this pictures shows where you check to see if you have received any "Private Messages". Look for the yellow arrow. This picture is of the upper right hand corner of your browser page that you are now reading. What Year range are we looking at for this contest? It is any benchmark that you have not found and is listed in the GC.com database. No age restrictions. 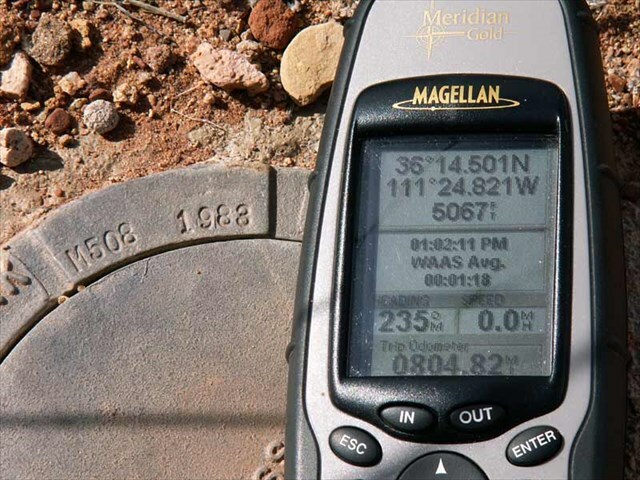 Do you need to prove the date of your find with a "timestamp" type picture with your GPSr in the photo. If I found a disc on the 28th of Feb. would it count in the contest? I am guessing no, but how is the find date verified? I'm afraid there is nothing to prevent someone from cheating and finding a benchmark ahead of time. Anyone can set the date on their camera or GPSr & take a picture and then reset the correct date. If anyone gets caught cheating we will post the name in the forums (in several different threads & forums) so everyone else will know what they did. Actually, in the past contests that we have had, we heard no complaints of anyone cheating, and we hope things stay the same for this contest. Besides, everyone watches these contests to see what everyone finds! Lots of eyes keeping tabs on the contestants! Thanks. I hadn't thought about altering a time and date on the equipment. I guess if someone wants to cheat they will do most anything to cover their tracks. I have noticed the high standards and camaraderie of the participants in this forum/community and suspect that you are right when you say that cheating has not and should not be a problem in this particular contest. Thanks for the clarification and the explanation. I was just about to start hunting benchmarks myself. Now I'm glad I waited! - any benchmark you have not found. Others may have found it, just not you. I've never seen a way to set the time on my GPSr, timezone OK sure, but time? Doesn't it get that from the satellites? I don't remember how I did it now, but I have reset the time and date on our Meridians in the past. It might have been one those secret button combinations that I used to access the hidden menu. DNF Example / question: NGS database not found (by NGS! ), but recent finds on GC.com. The last NGS database entry for DX1771 was Not Found, but there have been three prior find logs on GC.com . So - check me on this: No bonus in the contest, because of the most recent GC finds, even though the NGS had a Not Found. Right? (Assume it was the contest period, and I had the required GPS with date in the picture). Sorry for the newbie question, but how does one sign up? Klemmer, If the latest log is a DNF on the NGS (recorded after GC got their copy), then you will need to post a link to the NGS datasheet. If there is a more recent found log on GC.com that log is the one that counts. The last log (the most recent) must be a DNF & it can be on either NGS or GC, just so it is the newest. How's that for clearing the water? Jeff, just go Here and sign up. Aye, clear water, captain. Thanks, John. Last Sunday, I recovered the mark on Saddle Mountain, DV1911. Nearby, there was previously a mountaintop cairn, Saddle Mountain Cairn DV1910, not there and destroyed. A previous cacher visited the mountaintop, and posted a photo of DV1911 as a 'found it' on the page for DV1910. As the contest has not yet begun, the point is moot, but I was wondering if I really 'missed out' on the 'bonus points' for an incorrect log or not? As I understand the rules, you would need to post a find, showing the correct benchmark for it to qualify for that bonus. DV1910 was the benchmark with the incorrect log and photo. You are correct that DV1910 was logged wrong. There is also a possibility that you also logged it wrong. Most "CAIRNs" actually have a mark below the center of them that has been cut or drilled into the bedrock. The mark is how they know where to put the pole that is in the center of the cairn. To claim the wrongly logged benchmark you would need to post a picture of the correct mark (or lack there of) on the benchmark page. Harry: that is where a good metal detector comes in handy! It's only one small hole that you would need to make in the pavement..........best done in the wee hours of the night Just remember that the 2oldfarts refuse to cover your "expenses" for such a recovery! We have received an e-mail asking if we were interested in receiving a well used Schonstedt GA-52 Mag pin finder as a prize for the contest. It is on page 69 here. The owner says there is a missing knob, the rubber tip guard is also gone and there is no case for it. Just remember, it is used and has some missing (minor parts), but it does work. We asked the owner to post a picture of it here, so you could see the actual condition. Consider it added to the prize list. This is probably a simplistic, newbie, question but about how many BMs did the winner find in the last contest? I'm just trying to get sort of an idea of how many to "aim" for. I know the final winners will hinge some on how many DNFs, Destroyeds, etc are found. Just trying to get a ballpark figure. Thanks. We don't have the figures from the last contest, but it was in the 75+ range. edit because I'm getting old! Hee Hee, I made John count and the winner of the last contest (Me & Bucky) logged 234 actual benchmarks! Here is your link for seeing how everybody did. Also, I think the "Noobie" in benchmark hunting has the advantage this contest by being able to win by just logging "any" benchmark they come across. The "Seasoned" hunter will have to skip many due to the fact of having found them already, so they are going to really have to work for any points they get. SO, have lots of fun with this contest! thank you very much. Now, I'm afraid, another relatively Newbie question. How can one get a picture close enogh to read both the GPS and the inscripton around those BMs that are a rod in a tube with the inscription in very small type around the top of the tube. Any suggestions? Thanks so much for yoiur patience. We usually take both an open lid shot & a closed lid shot. With the lid closed you can set the GPSr right next to where the designation is stamped on the rim. If your camera has a macro setting use it. If you can see the coordinates in the camera view finder, take the shot. If there is too much glare to see them try putting a small flat stone under one side (or the end) of the GPSr to tilt it. Look through the view finder again and see if you can see the coordinates. Adjust the stone as needed to get a clear picture. Also, you can try taking the picture at a slight angle to reduce the glare from the sunlight and to prevent your reflection from showing. It helps to try and have the sunlight fill the entire GPSr screen so it is "lit-up" instead of dark. This is an image from GP0383. You can see one of the two nobs missing in the closeup. Its had a lot of use but still works. I saw in the back of "Professional Surveyor" magazine someone advertising they rebuild these. I forget how much they charged. I check next time the mag arrives if anyone is interested. Thanks, John...I had no idea. It appears I have set someone up for a 15 point recovery...perhaps I should change it to a 'Not Found'? I see one on EBay. The current bid is 225! Does the BM need to have 'magnetic material' for this to work? Absolutely, they only work with ferrous metals. Any mark with concrete and brass, which most benchmarks consist of, will not be picked up. Still a great prize, with many uses. Time stamp is not required, correct? As long as the last log says "Did Not Find" it counts. It could be listed as a "found it smilie" and still says something like "We were in the right place, just didn't see the disk so we are claiming a find.". Any DNF as the last log is what we are looking for. Ok, another dumb question but i just want to be sure. If we logged it as a dnf since the January deadline we can still claim it as a regular find even if not a dnf, is that right? Correct, if you logged it as a DNF after the Jan 25th deadline, it will count as just a regular find. Of course,if the log before yours meets the DNF requirements, then it would be a "found DNF". It could be listed as a "found it smilie" and still says something like "We were in the right place, just didn't see the disk so we are claiming a find.". I think I have seen that log! If I can find it again, I'll link it. I do have a couple of tough ones like that. Now, if I can only find the little buggars! Does this mean that you will scream uncontrollably if your battery is running down?? Ok. For a real question. How does this thing work? Now I know I am getting OLD. I posted in the discussion about the SHORAN. I was reading and for some odd reason CONSTANT stuck in my brain. After I posted the next topic was this one. Now for some odd reason I read it to say CONSTANT A FOOT. It joggled me for a second from all them big ole words I was just trying to read and learn a little something. And the constant was (is)...the metre or meter. That's just a little more that a foot. I am ready for the contest and I hope the contest is still afoot. These things are standard equipment on most survey crews because, although they will only detect ferrous metals, they will do so to a depth of about 6 feet for a typical iron pipe. It works by comparing the magnetic field at each of two sensors in the long shaft - one near the tip and the other near the head. The greater the disparity in the magnetic fields between sensors, the louder and shriller the tone emitted. So, as one sensor, at the tip usually, gets closer to an object with magnetic properties than the other sensor, the tone indicates the relative difference between sensors. It works so well, you can detect a masonry nail beneath several inches of pavement with such accuracy that the nail can be excavated with a minimally-sized hole. How do you post a hot link? Is it a requirement to have the GPSr in the picture? I don't like to "spoil" a good benchmark picture. "Scoring = 1 point per verified regular benchmark find plus any special finds that qualifies. Intersection stations (towers, flagpoles, & other tall benchmarks) will need a picture showing the benchmark up close. You must be no farther away than a city block. Pictures of a disk must be readable. If we can't read the disk there is no way we can verify the find." This is a hot link to see which button to press. How do you make a live link to the benchmarking log? The 'live link' is the same thing as the 'hot link' in John's previous answer, but I will link to it again - just click "here to scroll down a little to see a picture of a blue arrow and a red arrow', then first you need to go to the Log page and highlight the address in the address bar. Then you will need to right click it and click "copy". Then, when you are posting your finds in the 'logging thread'...click where the 'Blue arrow' is pointing and right click in the little box, then click on "paste". Now click on the "OK" button and it will come up with the next box, that says "My Webpage" - This is highlighted so, just type the PID # and what you found - REG, DNF, DES, ERR and click OK.
Hit the Preview Post button at the bottom of the reply page to see your handywork. Also you can click on your link right there to see if it works like you want. Just look at the post by AZcachemeister to see the correct way to accomplish this. If you have any more questions...let me know in what area to go over with you. Thanks. I've been trying. but, when I click the "insert link" box the "paste" option is not light or active or whatever. It will not paste anything in it. It will paste in the middle of the message box but not the insert link box. Now I'll click on the earth icon (blue ball) then right click in the box and do "paste" ... OK, now type in the title "Wellsley" in the next box. Never mind the link I chose. I just happened to have it in another window. I haven't got any finds yet, so I don't have the real Macoy to demonstrate. I finally got "paste" to be hightlighted in the box when I right click the earth icon. I click paste in the box and nothing happens. Before you do the "paste", you need to have something in the buffer to paste. In other words the "paste " is the second half of the process. > highlight the location (the thing starting with "http// ... ") in the location window at the top. > Go back to you contest entry post and hit the blue globe icon. the link window appears. > right-click and hit "paste" or just type Control-V. The location from the benchmark log that you copied in step 1 should appear. > then type in the required text (e.g "LX4113, REG" or whatever.) into the second window. I'm sorry. I forgot to say I had copied the URL for the benchmarks webpage. still, all that happens when I click paste is that the box closes. Thanks for the help. This shouldn't be this difficult but I think there is something weird going on with my computer. Thanks for your help. I think I finally figured it out. Happy Benchmarking!